(Newser) – Officials say a giant "fatberg"—a mass of hardened fat, oil, and baby wipes measuring 210 feet long—has been found blocking a sewer in a southwestern English town. Andrew Roantree, of South West Water, says it will "take our sewer team around eight weeks to dissect this monster in exceptionally challenging work conditions," reports the AP. He urged the public not to pour grease down the drain or flush baby wipes down the toilet, adding: "Put your pipes on a diet and don’t feed the fatberg." The revolting fat mass was discovered in drains in the coastal town of Sidmouth, though Roantree tells the Guardian that it was "identified in good time with no risk to bathing waters." 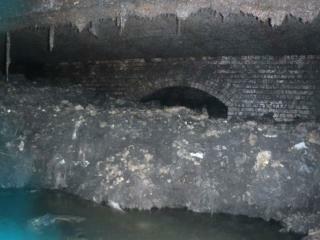 In 2017, an 820-foot-long fatberg was found in sewers beneath Whitechapel in east London. A chunk of that later went on display at the Museum of London, nestled inside transparent boxes, and was also livestreamed on YouTube. So when does this become a SyFy horror movie? Don’t know why people think you can put everything down a drain. I’ve had people tell me they put coffee grounds down the drain “to clean it out”. All it did was clog them up more. Not mine, theirs. My MIL always drained hamburger down the drain and then complained it stunk. Put all of your grease in a can in the freezer so it can go in the trash.